Travel with Kevin and Ruth! : Fun time sailing San Francisco Bay! We chose to do the sunset cruise. It was foggy all day in the bay though, and we were a little worried about what they would do if the fog didn't clear. We got to the dock at 3:45pm, and although there was blue sky in the city itself, you could still see thick fog out near Alcatraz Island. Here's the boat we're going to be sailing on! Here's Captain Hans, giving us all some instructions. If you didn't bring proper clothing...no worries! They have various sizes of jackets to keep you warm in case it's a little cooler than you thought it might be out on the water. Included in the ticket price are snacks and two alcoholic drinks each! Never counted, but we think there were between 20 and 25 passengers, so it was a nice small group. Lots of room on the boat, with many choosing to stay outside on the netting. Can you see the fog at Alcatraz? We had just got underway and out of the harbour. They got some of the passengers to assist with the sails, and they shut down the engine. As you can see from the waves in the photo above, there was quite a bit of wind. Perfect day for sailing! Fellow passengers helping with the rigging. We made it out to Alcatraz Island, and now we were in the thick fog. Kind of a weird experience...you could easily imagine yourself floating aimlessly, lost in the middle of the ocean. Captain Hans blew our foghorn several times, and you could see his eyes constantly scanning the haze looking for any other boats that might appear out of nowhere! Alcatraz Island in the fog. But we came through the fog, and all of a sudden there was Golden Gate Bridge! Other passengers enjoying the view. There's the bridge, with part of it still in the fog. Captain Hans brought us right under the bridge, then we turned around and went back to the other side to be in time for the sunset. Other boats were waiting for the sunset as well. There's the moment we were waiting for! We couldn't believe how lucky we were with the fog. It actually ended up making the whole experience fascinating, and it cleared up just in time for the Golden Gate bridge and sunset to be perfect. Really fun time, and Captain Hans, along with crewmates Patrick and Michael were great. Couldn't have asked for a better experience. 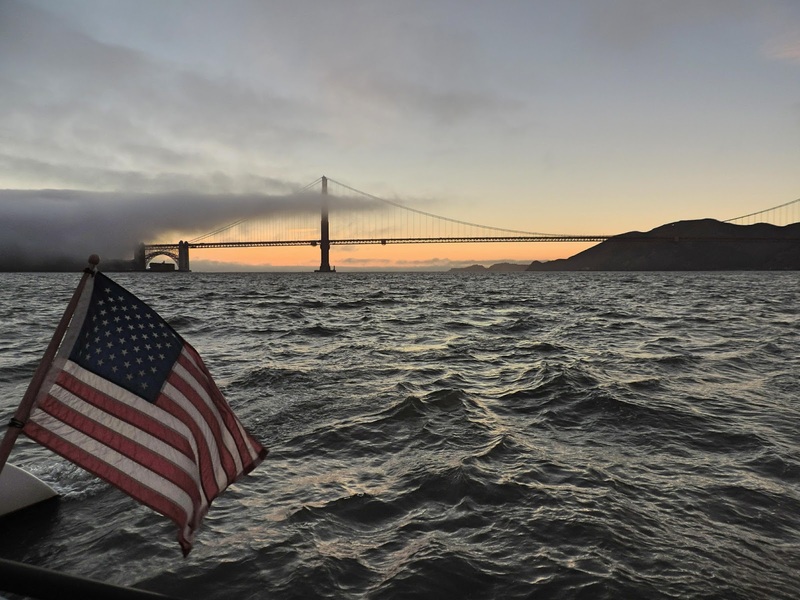 When we compare this to the other bay cruise options, we think this was the best. They're all priced between $40 and $50, so we think it makes sense do do something different rather than being on a big noisy ferry style vessel. Nice day to be on the water. Just enough wind, and a few goodies if you're hungry. We weren't so sure that it was going to be good because all day the bay was in fog but it ended up turning out to be perfect. Don't think it could have been any better. Thank you, it was such a fantastic evening out there. Pure fun, I sure miss our boat. After an evening like that, we can totally understand! Looks like a lot of fun. Maybe a bit chilly? It was fun and we are so happy we went with the catamaran over the normal sightseeing boats. It actually wasn't too chilly, a bit windy at times. We were glad that we just had our normal spring/fall jackets on and that we didn't need those really warm jackets that they supply. Enjoy! We are having the first snowflakes of the winter in Cabri. You are making us shiver, glad that we are somewhere warmer right now! One gal in a sleeveless top and another with gloves on! You could probably sell that last picture to a US magazine. Also first snowflakes in Ottawa! If you look again, that girl isn't sleeveless, she has a pink shirt on under a white vest. Not really sure why the other lady has on a pair of gloves because it wasn't that cold out. It was cool but comfortable. Snowflakes in Ottawa, is making us feel cold though, glad we aren't there! Very cool! The pic of Alcatraz is awesome. I think you guys chose the right one. Snow in Cabri? Good thing your way south of there. Thanks Chris, we think we made the right choice too! Now that looks lie a really great time! It was a great time. It was also wonderful just having a small group on board because it made for some nice socializing too! What gorgeous photos! I am glad you had such good weather for your sail. Believe me, you do not want to be sailing in dense fog. It's seriously scary. But what you had was perfecto, and the food/drinks sound perfect. Thank you Emily! We were happy it turned out so well too. The fog lifted just at the right time and we had great company, we could not have asked for more. It's often cooler on the water than you'd expect. Nice that they provided coats for your trip. Great pix, especially with the fog. It was even better that we didn't need to use the coasts. It was cool but not cold. Gorgeous shots, especially the bridge at sunset!